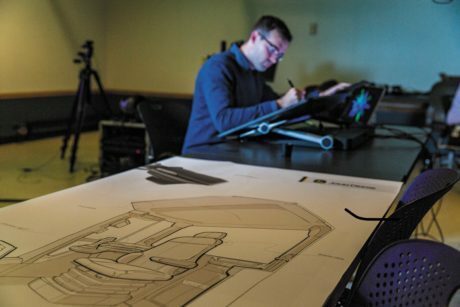 Troy Maddox, Industrial Designer, John Deere Dubuque Works, puts himself in the customers' shoes and creates designs and functionality to meet their needs. As a kid growing up among the vast cornfields near Atkins, Iowa, Troy Maddox cultivated dreams as tall as late-summer stalks. But those dreams would occasionally sprout at the most inopportune times. It was clear from an early age that Maddox was downright delighted by doodling. A pen, to many of us, might seem rather ordinary. For him, however, it’s a precision instrument of creativity as vital as a conductor’s wand, an artist’s brush, or a watchmaker’s loupe. At John Deere Dubuque Works, a sprawling factory in Dubuque, Iowa, where construction and forestry equipment is manufactured, Maddox brings his vivid imagination to life. Fusing functionality with aesthetics is the synthesis of style and substance. When you sit behind the wheel of an 872GP Motor Grader, you expect every control to be easily accessible. You expect a comfortable seat that’s positioned for maximum visibility. But you also want a cab that looks as good as it performs. 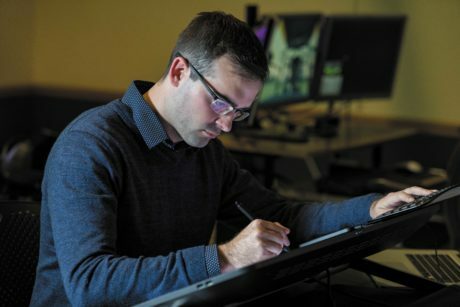 “We designers go in and start to visualize the interior environment using either pen and paper or software like Adobe Photoshop™,” Maddox says. “I’ll sketch it up and show it to our engineers and customer groups. They’ll study it and say, ‘hey, that looks good” or they’ll give me a different opinion. In the old days, designers used to pull up a chair to the drafting board, unfurl a roll of paper, and carefully use a triangular scale and straightedge to draw a new product. Maddox’s desk is outfitted with what appears to be a floating horizontal television screen. It looks almost Jetsons-esque. There’s another cool part of his job, too. 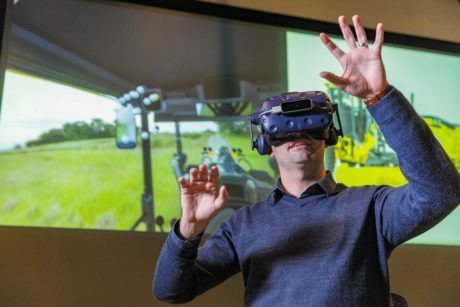 Deere makes significant investments in industrial design technology though Maddox’s role, as industrial designer, is relatively new for the company. Currently, he says, there are approximately ten employees worldwide working in this capacity. 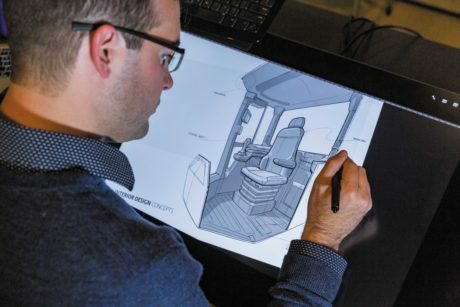 Maddox already has designed interior components for the new 524 – 624 L-Series Wheel Loader line and says he’s working on several more exciting products, including full interiors, in the future. 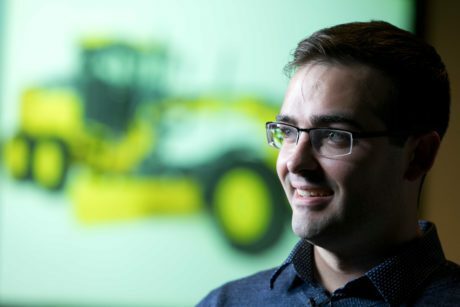 Maddox’s path to Deere is filled with twists and turns. And that’s just fine by him. Getting to Deere, though, was quite a journey. After graduating from Iowa State University, Maddox began an internship focusing on digital interfaces in 2013. He then worked on exterior design for the S430 and S440 Combines at John Deere Harvester Works, followed by a position created for industrial designers within the engineering development program. Every job has its challenges, but Maddox has a relentless drive to build better products for those linked to the land.